Kampala, Uganda | THE INDEPENDENT | Uganda’s main electricity distribution company Umeme have registered growth in several sectors in financial performance for the year ended December 2018. Electricity sales increased by 13% to sh1,601 billion in the year 2018 while net revenues increased by 0.8% to sh1,493 billion in 2018 compared to 2017. “As a result of our investments strategy and operational performance, we registered growth in financial performance for the year ended 31 December 2018,” a statement from UMEME said. The statement said growth in electricity sales was driven by increased demand and tariff applicable during the year. The operating costs of the business increased by 13% to UShs 226 billion in 2018, compared to UShs 199 billion in 2017, on account of increased business activities and general inflation adjustments. maintenance to ensure public safety and supply reliability,” Umeme said as they released their financial figures for the year ended December 31. The energy losses for 2018 were 16.6% compared to 17.2% for 2017 and 27.3% in 2011. The statement said key drivers included Introduction of prepaid metering ; Improvements in quality of services and public support on the fight against Vandalism and illegal connections. Umeme congratulated the Government of Uganda for the successful commissioning of Isimba HPP (183 MW) on 21 March 2019. Uganda’s installed generation capacity is now projected to increase from the current level of 1,167 MW once Karuma HPP Dam (600 MW) is commissioned in December 2019. 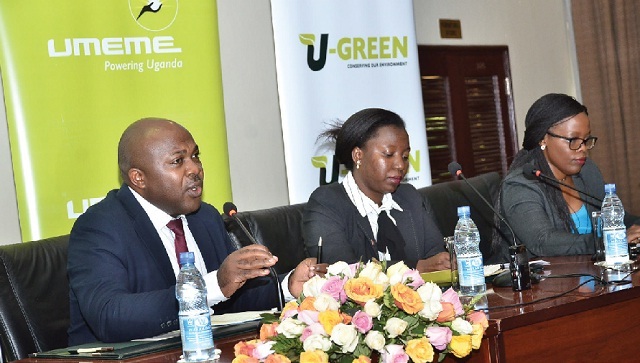 “Umeme is positioned and aligned to support Government in achieving its development agenda,” Umeme said in their statement. As in the past, Umeme offered shareholders a dividend.